This morning was not quite as painful. It was a 7am wake up with coca tea and breakfast at 7:45am. Breakfast was of course amazing, as per the rest of the food on this trip. It is always so surprising that they can produce such high standard food from just a tiny little tent. We didn’t eat the same thing twice the entire time AND they catered for my dairy free! First stop an hour in was some Inca ruins and time for a little history lesson. 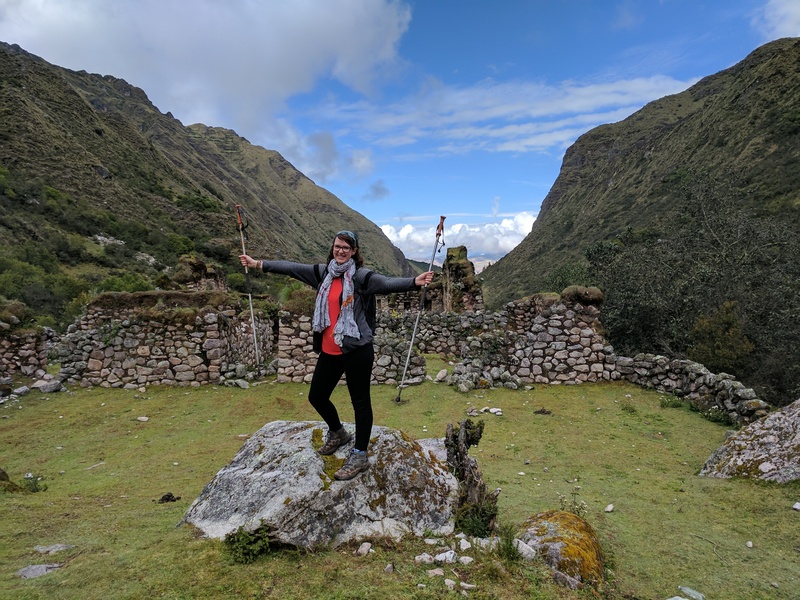 Did you know that previously the Inca’s believed that if people were showing signs of altitude sickness (they didn’t know what this was obviously), they believed it was a sign that the individual was not one with nature and so the mountain was taking their soul. They did not belong there. I thought that was fascinating. We followed the trail further past more waterfalls, picturesque views and rocky paths. It was a really enjoyable walk today. 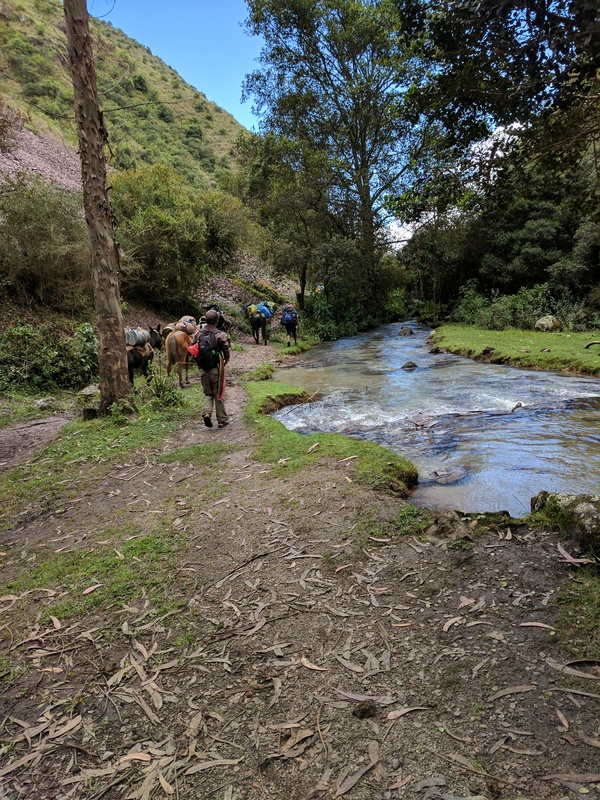 The end was in sight, the weather was perfect and despite my boots falling apart on my feet, I was feeling good – I was completing the Lares Trek! As per the rest of the trip, we smashed the timings and got to the bus way ahead of time and so were taken to the lunch spot to play cards (good old scum!) whilst the team prepared our spectacular feast. After lunch we rolled ourselves to the bus to head back to Ollytaytambo to catch the train to Aguas Calientes. 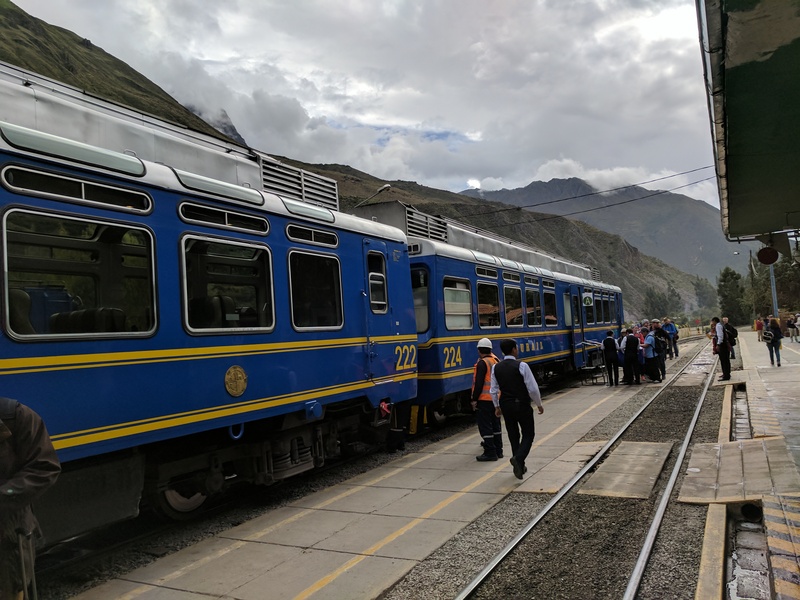 The train was super comfortable, we got a complimentary quinoa strudel and drink and the views we got of the changing landscape were mesmerising. I found it to be quite a relaxing hour and a half. At the other end we were taken to the hotel and we were given time to shower!!!!!!!! Nothing had felt so luxurious in a long time. My hair could be washed and I could be clean – with warm water! First world problems…. As if the only thing missing from my day was more food…..But that’s what I got. We headed to a nearby restaurant where I tried alpaca (please do this, it’s amazingly tasty!) And pisco sours (also very tasty so please do this too!). I have just got back to the hotel and laid down on the bed – hallelujah! I think I will finally be having a good sleep.